Gunnera* is the big, architectural plant that looks like large, wild rhubarb. I'd been on a walk when I came across a large patch of the stuff. Taking a shot like this from near ground level would have been easy if I'd been carrying a Rolleiflex TLR but it was my old Nikon F with 24mm, 35mm and 105mm lenses I had with me that day. 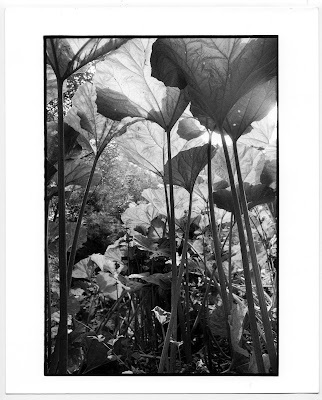 The film was HP5+ and there was a bit of sunshine around so I was able to stop the 24mm lens down to around f11, crouch down, hold the camera vertically beneath the big leaves and just guess the composition as I couldn't see through the viewfinder. I took three shots and all came out well - just luck I suppose as this sort of thing is more or less a hit or a miss. The exposure was good as well and the negs, developed in Spur's HRX-3 and rated at 250 ISO, have plenty of shadow detail in them. I can print the negs dark and heavy, light and airy of anywhere in between. They can also be printed softish in terms of contrast or more punchy. The version on this page is about in the middle, a fairly literal interpretation of the scene on that particular day. It's a fairly straight print on Ilford Multigrade IV FB - 14s at f11 on grade 1. I dodged a couple of shadowed areas for two or three seconds each and burned in a few bright bits of foliage where the sun was shining through and almost wiping them out. The reason I printed it was to be able to assess HP5+ alongside the Tmax 400 I've been using a lot lately. I don't need nor want in my normal shooting totally grain-free prints but I do need a film fast enough for comfortable hand-holding throughout the day. Tmax developed in Rollei RHS DC is nice and sharp with small but well-defined grain. The prints it produces are very pleasing having a good balance of qualities that are, to me, satisfying on 10x8 inch paper. It can stand a bit more enlarging without compromising that look too much so it's just the job really. Having said that, I'm not finding the developing to be as straightforward as I'd hoped. I first started using the Rollei dev with TMY when it was being sold by Firstcall Photographic under their own label. At that point, the standard dilution was 1+7 at 6 mins although I used it 1+9 for 7 mins. Now, however, the developer is "double concentrated" - a bit like your Robertson's barley water can be found these days - so it's supposed to get the same 6 mins but now at 1+15. That's sounds easy enough except my negs are coming out under done. I don't know what the reason is as I'm doing everything just the same. I'm up to 6:30 now on the dev time and they're still needing a bit more so the next film will probably get 7 mins. It doesn't seem to me, therefore, that the developer is exactly - or nearly so - double strength but slightly weaker than that. Who knows. Glitches like these in the photographic process get me thinking about times past when I was producing some nice negatives using HP5+ developed in Perceptol 1+2, as recommended by Barry Thornton. 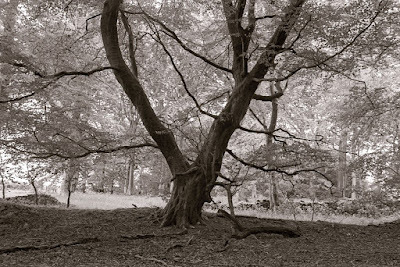 That combination isn't as fine-grained as Tmax/Rollei RHS DC but it's not far off. Grain isn't a problem at all in the gunnera shot on this page. Results, due to the more forgiving nature of the Ilford film, the compensating effect of dilute Perceptol and the lengthy dev time all meaning the outcome is less affected by minor errors in time or temperature, can also be very consistent. I believe it was just that combination - HP5 and Perceptol - that tickled James Ravilious's aesthetic funny bone. Like, James, though, I'd have to rate the film at about 200-250 ISO as you lose a bit of speed with Perceptol albeit not as much at 1+2 as with the stock solution. That speed is fine throughout the summer months but it's pushing things a little up here in Scotland in the winter unless I exercise some discipline and use the tripod. For those occasions where I really do want as little grain as possible and maximum sharpness and detail, I could also shoot some Pan F in Perceptol, another really good combination. So there's much to be said for sticking with "old technology" - well, older than Tmax - and reaping the rewards of consistency and easy to print negatives. It just so happens that I'm out of Tmax 400 so perhaps a few rolls of HP5+ and a bag of Perceptol are in order. * I noticed whilst writing this that I'd posted this image a while back but referred to the plant then, for some reason, as burdock. Still, they share a "u" and an "r" so I wasn't that far off. Nice print Bruce - you're back like a duck to water! I have had very nice results with TMY400 developed in Adox FX-39. Lots of sharpness and plenty detail in the shadows. More grain than normally expected with this film, but it is a very fine, salt and pepper style grain. In short: if I really want as much resolution as possible in a 400 ISO film I will use this combination. I've read quite a lot about FX-39. The grain is the only thing stopping me from giving it a try. Maybe one day. Got both and you never know. What it IS good at is not blitzing highlights when I've been in unusual lighting situations, and there's also an 'etching' quality to well-exposed negatives that I've not seen with anything else - hopefully I can get some time to print up some of these things properly in the near future! 22 mins passes like . . er . . 22 mins when I've got some music on. I think it might well be the case that I mixed Bath B too hot (easily done) hence it's lack of oomph at standard dilution - next mix will be different. Interesting, Andy. Do you notice any difference in the results over 1+2 or 1+3? Is that an hour-long stand? It's certainly a much more economical way of using Perceptol. And different films at the same time?